Gloria and Jose Fuentes were seventeen years old when they arrived to the United States in 1978. Like many other young Salvadorians, they were filled with hope – longing for a better life than what they were experiencing in a cruel and intense civil war, and civil chaos which lasted many years (decades) in El Salvador. Without knowing each other, Gloria and Jose settled in Houston, Texas and faced the precarious existence and survival difficulties of undocumented immigrants for some time. Fatefully, love created a miracle when they met and moved to Dallas to work with Gloria’s sister at a Salvadorian restaurant, which her sister owned in Oak Cliff. 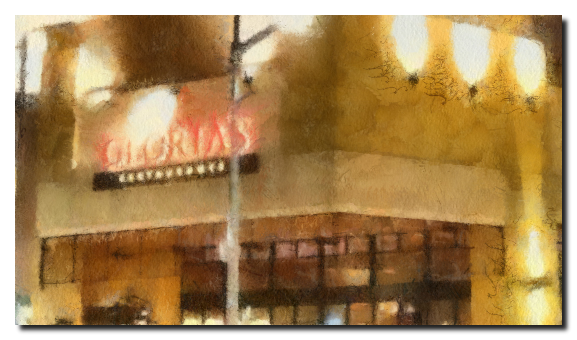 A year later passed, and Gloria’s sister gave up on the restaurant and Gloria and Jose chose to take over. Despite all the obstacles, and showing amazing resilience and a persistent work ethic, their life was beginning to change for the best. Playing an entrepreneurial role – with no previous knowledge – they registered the assumed Gloria’s name before the Dallas County Clerk on April 15, 1986. A few months later they became legal U.S. residents under the amnesty provisions of the Immigration Reform and Control Act of 1986. Under Jose and Gloria’s management, the little Salvadorian restaurant became distinguished for their tasty food. It was so full of flavor that an undercover critic of the Dallas Morning News gave them a very positive review. The next day there was a considerable line of Anglo clients waiting under the summer sun of Dallas, for an opportunity to indulge in the new and delicious dishes. Even William “Bill” Clements, Jr., the Governor of Texas at the time, was one of those curious customers. Gloria’s growth has been a constant since then. Financial organization opened their doors to Gloria’s for the first SBA loan in 1999 and continues to show support to the fourteen restaurants they own today. Coincidentally, this coming April, Gloria’s will move their first small restaurant in Oak Cliff to the historic Fire Station building in the neighborhood, in celebration of their 25th Anniversary of triumphs. As well as, celebrating Gloria’s unique attention to innovate and delight their customers taste and senses. Texas’ very own smooth jazz band The Brew is performing in this venue. Slim Man is singer, songwriter, bassist and a man, who isn’t in the constant pursuit of perhaps unattainable material goals, but takes life as it is and receives solely from the existing beautiful things personal satisfaction. Reading his diaries, enjoying his receipts of belle cuisine and listening to his beautiful music is like Yin and Yang. Before I fall into raptures here some facts of his musical career. Songwriter for Angela Bofill, Brian Jack, the Temptations, Carl Anderson and finally creator of his debut album End of The Rainbow (1995). He really found the golden pot and continued with Closer To Paradise (1996), Secret Rendezvous (1997), Jazzified (1999), All I Want For Christmas (2000), For Now And Forever (2003), Bella Mia (2004), Solstice (2006), Christmas Eve (2008), and in 2010 Thousand Miles Away. Also to mention is his side project Bona Fide. In 1998 Carl Griffin needed a funky jazz group for his new label. So Slim Man gathered some of his buddies to record the first album Royal Function (1999), followed by The Poe House (2001) and Soul Lounge (2005). 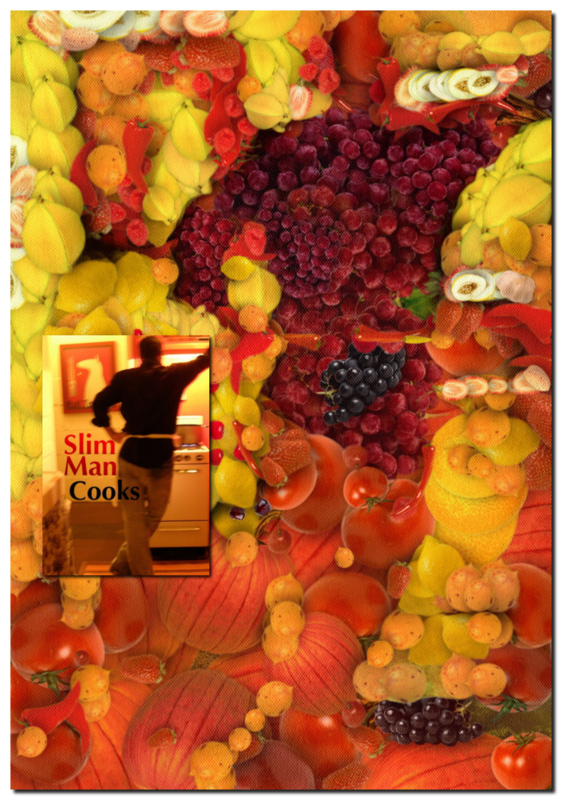 Visiting his website you will discover another side of Slim Man: Slim is an excellent cook. He has two cooking DVDs in his collection. The first is a Lo-Def, Lo-Tech collection of 16 cooking videos, each about 5 minutes long, that show you how to cook some of the Slim Family recipes, along with Slim Man’s own original recipes. Most of the dishes are vegetarian–some seafood, some pasta–all delicious, quick and easy. And the best part? They all feature Batu, that crazy bull terrier dog of Slim’s! Most of the videos are shot in the West Wing of the Slim Shack, in a funky little kitchen in Baltimore that’s cozy and cute. Other videos were shot in New York City, and upstate New York. The second DVD continues this collection. Combine smooth jazz with fine cooking. That was the idea of Sharon O’Connor. Mark DeAnda, formerly an exec in smooth jazz radio, conceived of and produced the book. Bettie Miner illustrated it. 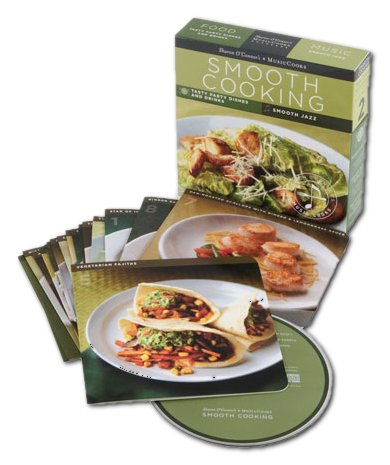 Sharon collected the songs and delicious recipes by smooth jazz musicians and their favorite restaurant chefs. 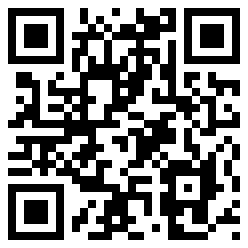 At her website she offers 16 recipe cards and her special music collection. From Tom Scott’s Easy Chopped Salad to Smooth Jazz Burger there is something delicious to discover. Relaxing with smooth jazz and a perfect meal that is the ideal amalgamation.